Clinical Specialities: Female urology and incontinence surgery, Paediatric urology, Benign reconstruction, Oncology and General urology. 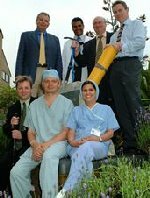 The pictures shows Mr. Morley and the rest of the team that climbed Mount Kilimanjaro in early 2003 to raise funds for the Kingston Hospital Cancer Appeal. Taking a breather. Left to right, back row: Peter Willson, Ian Bloom, Kaushik Patel, Roland Morley, Andrew Pooley. Front row, Amrit Gill, Abdulsatar Ravalia and Carol Stableforth. The General Medical Council of the United Kingdom has given the following advice to doctors in relation to e-mail consultations. 1) The doctor asked to discuss e-mail cases will not know the full patient details. 2) Not all facts including the findings from a physical examination of the patient and the past medical history may be known. 3) There will be no provision for the monitoring of a case or follow-up care. Accordingly, clinical advice should be obtained from your own general practitioner or surgeon. Unsolicited E-mail asking for medical advice, surgical or physician referrals and sources of medical information can only be answered in a general non-specific sense. Should you wish to obtain detailed advice from Mr. Roland Morley, you are advised to make an appointment for a personal consultation. It was cheers all round at Kingston Hospital this week for the team who climbed Kilimanjaro for KingstonCan, the Kingston Hospital Cancer Unit Appeal. On 10 January, seven consultants and a nurse from Kingston Hospital flew to Tanzania having trained for months for the climb. They are: anaesthetists Carol Stableforth and Abdulsatar Ravalia, urologist Roland Morley, general surgeon Peter Willson, pathologist Kaushik Patel, gynaecologist Andrew Pooley, colorectal surgeon Ian Bloom and Day Surgery Unit staff nurse Amrit Gill. Six of the eight members reached the summit of the mountain (19,400 feet). Two team members were prevented from exceeding 15,500 feet by altitude sickness. One member of the team remained in East Africa for treatment and convalescence for his altitude sickness and is now home. The rest of the team returned at the beginning of last week. Provisional estimates indicate the team has well exceeded its target of raising £10,000 for the KingstonCan appeal.